If you're bored with your stock messaging/texting app, and need a change, GO SMS PRO (Unlocked) is a highly recommended alternative. Although there are many apps out there that deliver almost the same functionality like Textra and many more, GO SMS Pro Premium blows them out of the water with its simple, intuitive interface, and unparalleled customization options. 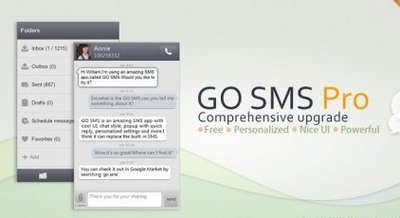 In addition to the standard features, this Pro/Premium full version of GO SMS supports disabling all sponsored messages, adds an advanced Private Box, and unlimited cloud storage space for message backup. Not to mention all paid themes (by upgrading to Themes VIP). The Apk we provide below also has all plugins and language packs included. 1. Material Design: New look. New experience. 2. New Interface: Just one swipe to switch between five bars. 3. GO SMS Store: Find trending themes, stickers and fonts here. 4. Discover: Discover the latest, coolest online activities here. More to explore... Only on GO SMS 7.0. Install apk, use additional files if needed, have fun!